Riot Games’ League of Legends World Championship was the most watched esport tournament in 2018. Esports looks to reach new heights this year as the industry is projected to exceed $1 billion in revenue, according to Newzoo’s global esports marketing report released today. Included in Newzoo’s definition of revenue are media rights, advertising, publishing fees, merchandise, and sale of sponsorship. Not considered to be revenue by Newzoo include online gambling, player salaries, prize pools, and capital investment. This billion dollar revenue forecast is based off Newzoo’s “predictive esports market model,” which includes data from sources such as macroeconomic and census data, and primary consumer research. Leading the charge in this billion dollar projection will be sponsorships, which Newzoo expects to make up 42 percent of the esports market’s 2019 revenue, with media rights in second at 23 percent. 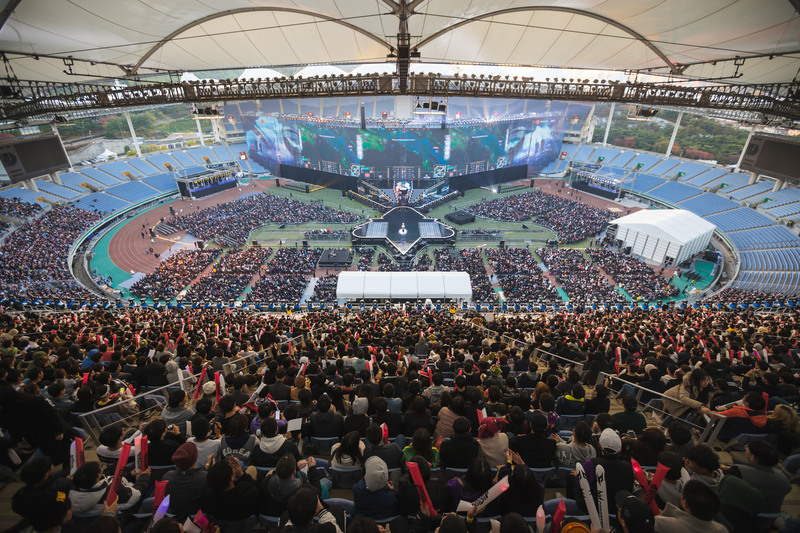 In addition to this billion dollar estimate, Newzoo’s report compiled a wealth of data regarding the 2018 esports market numbers, across game titles. League of Legends was the most watched esport in 2018 at 347 million hours, followed by Counter-Strike at 274 million, and Dota 2 in third at 250 million. In fourth place was Overwatch, which had 101 million hours watched. For tournaments, League of Legends once again is at the top, with the game’s 2018 World Championship earning 53.8 million in viewership on Twitch. Fortnite was the most watched game by non-esports viewers for Twitch, with 1.6 million hours watched. Blizzard’s inaugural Overwatch League season was the most watched esports league on Twitch, boasting a viewership of 79.5 million, with the NA LCS in second at 41.7 million. With Riot Games’ regional leagues all in progress, and Blizzard’s OWL two days away from its season two debut on Feb. 14, the esports market has already begun its climb to Newzoo’s billion dollar projection.